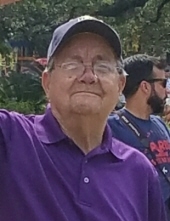 James Eddy Evans, age 84, and a lifelong resident of Dell City, TX, passed away on Saturday morning, January 26, 2019 at Resolute Health Hospital in New Braunfels surrounded by his loving family. James was born on January 9, 1935 in Fabens, TX to the late James Henry Evans and Pearl Arrila Boulware Evans. Mr. Evans served his country proudly in the United States Army. He was preceded in death by his parents; his siblings; and his grandaughter, Brehana Tayler Lewis. Survivors include his wife, Dixie Evans; children, James E. Evans, Tracy K. Baeza, and Shannon D. Lewis; grandchildren, Veronica Macias, Ashley Evans, Mikhail Baeza, and Cory Lewis; great-grandchildren, Addison Baeza, Logan Baeza, Kaiden Baeza, Penelope Pineda, and Grayson Pineda. A graveside service with military honors is scheduled for 9:15 AM on Friday morning, February 1, 2019 at Fort Sam Houston National Cemetery. To send flowers or a remembrance gift to the family of James Eddy Evans, please visit our Tribute Store. "Email Address" would like to share the life celebration of James Eddy Evans. Click on the "link" to go to share a favorite memory or leave a condolence message for the family.